The 3rd album from Spain’s most savage crew of ‘66 garage-punk worshipping scum of the Earth, WAU Y LOS ARRRGHS!!! This brand new long-playing monstrosity sees singer Juanito Wau, the barely human Rat Fink comic, continuing his long-held reign as the most bugged out screamer on the scene. Meanwhile, and we do mean MEAN, the remaining Arrrghs mutilate the massive, crunched-out riffs of 60s punk’s past (Cuby and the Blizzards and Jacques Dutronc, anyone?) and reconstructs them with spit, snarl and endless piles of fuzz and swirling Vox organ. Impolite, swinging brutality from the grave for the sweatiest go-go gorilla party ever! WAU Y LOS ARRRGHS!!! 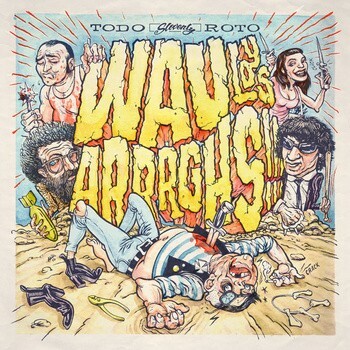 "Todo Roto" LP by Wau y los Arrrghs!! !